The previous spring 12 seniors graduated, leaving a large void for the remaining and incoming students to fill. Fortunately, they were up to the task! The 2012 game was Rebound Rumble™. A large group of Swartdogs met at the Cedar Falls Utilities meeting room to watch the Kick-off. That afternoon and the next few days, we discussed the game and possible strategies. While the robot was being built, another group was working on an updated scouting iPod/iPad app. Our first regional was the Greater Kansas City Regional. We quickly learned that the balls, besides varying in compression, also varied in diameter. This created a new challenge for teams. We were selected by the Number 2 seeded team and made it to the semi-finals. We were honored with the Gracious Professionalism award for our actions on and off the field. Our second regional was 10,000 Lakes in Minneapolis. We partnered with 3081 and 3747 and were undefeated in eliminations. We competed against a very strong alliance comprised of teams 2530, 2538 and 2232. We had great matches and ultimately won by only two points! Also at this regional we were honored with two awards. The first was the Industrial Design Award, which recognizes form and function in an efficiently designed machine that effectively addresses the game challenge. The other was the Website Award. This recognizes a team’s student designed website. The Championships in St.Louis were intense as usual. We struggled a little during qualifications, as did many other teams. We were pleased to be one of the top scoring robots. We were picked during the first round of eliminations. While we were on a good alliance, we were beat by the alliance that won later went on to win the Curie Division. The Rebound Rumble SM robotics game was the FRC game in 2012. The game consists of two three-robot alliances trying to score as many baskets as possible during the match. The game was played on a 27 by 54 foot rectangular field. At each end were 4 baskets in a diamond formation. The higher the basket, the more points it was worth. In the middle was a steel divider with 3 auto-balancing bridges crossing it. The game started with an Autonomous Period for 15 seconds during which the robot shot baskets using pre-programmed instructions. One robot from each alliance could be controlled using a Microsoft Kinec. The drivers then took control and try to pick up the foam basketballs and score goals. The matches ended with 2 robots trying to balance the bridge. 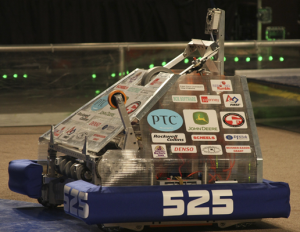 Bonus points were scored in qualifying if the center bridge has a robot from each alliance on it.